If you are like most of the wine drinking world, you probably regularly drink cabernet sauvignon , pinot noir, chardonnay, sauvignon blanc, zinfandel, syrah, pinot grigio or other readily available varietals. And that’s fine. But today, I’m going to suggest you spice up your palate by trying wines that are comprised of combinations of grapes blended into a single bottle. In my humble opinion, these blended wines (some call them cuvees or meritages) are superior to single varietals because they offer layers of complex flavors and are usually more supple than those made from one grape variety. Anyway, with so many grapes to choose from, wine makers over the millennia have settled on just a few hundred varietals to use in producing their particular bottlings. Specific geographic regions called appellations have been designated around the world and some governments have even regulated what grapes can be used and identified to denote being from a particular place. Red Bordeaux, for example, must be made from only a select number of grapes such as cabernet sauvignon, merlot, cabernet franc, petit verdot and malbec that are produced from grapes grown in that specific area of France. Chianti Classico must use at least 70 percent sangiovese with an allowance made for a few other varietals. And while there are incredibly superb single varietal wines, I’m convinced that those made from combinations are better and more food friendly. Take the wines from the southern Rhone Valley for instance. Growers of Cotes Du Rhone can use of up to 13 different red grapes, and even a couple of white varietals to make up their blend. Rhone and Rhone-like wines produced in other countries are usually comprised of grenache, syrah and mourvedre – sometimes referred to as “the holy trinity” – and can run the gamut from fruit forward easy drinking brunch type wines to full-bodied and tannic offerings, like Chateauneuf-du-Pape, that pair up wonderfully well with red meat. The Aussies have for decades understood the beauty of blending. One of my favorite wines produced by D’Arenberg and known as The Laughing Magpie is comprised of 90 percent shiraz and 10 percent viognier – a white wine. White blends are worth trying too, offering some of the same complex attributes as their red brethren. In Italy, Soave is a region where the primary white grape –garganega – gains weight and flavor from the addition of chardonnay. In Bordeaux, the classic white wine is comprised of sauvignon blanc and semillon. In California, a wine must contain 75 percent or more of a grape to be called by that varietal’s name which provides a good bit of latitude for the wine maker to add other grapes to the blend. Ridge Vineyards (my favorite zinfandel producer) almost always blends grapes such as petite sirah, carignane and mourvedre in their vineyard designated reds. And more and more California cabernet fans are trying “Bordeaux” style blends or meritages which can soften up and smooth out the sometimes hard tannins found in this famous varietal. Here a couple of my favorite blended wines that make my point pretty effectively. Give them a try and see. 2013 Tenuta Sant’ Antonio Scaia ($14) This lovely, silky smooth white from the Veneto region of Italy is comprised of 80 percent garganega and 20 percent chardonnay. Ripe apple and citrus flavors are balanced by ample acidity to make this the perfect match to pasta carbonara or Alfredo. 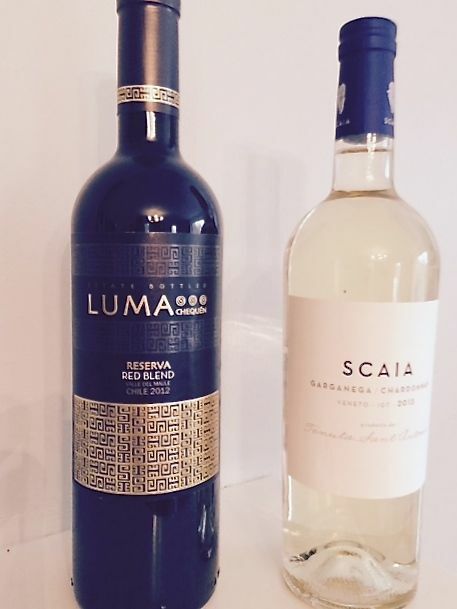 2012 Luma Red Blend ($14) Aged for a year in small oak barrels, this Chilean red is a blend of cabernet sauvignon, syrah and petit verdot. Round and rich with hints of chocolate, ripe plums and spice, this wine is perfect to pair with a roasted pork tenderloin sliced and served with a Dijon mustard, rosemary and crème sauce.